Villa Suralai is an exquisite villa. The views are superb – each of the bedrooms has full-length glass doors and excellent terraces. The swimming pool is fantastic (despite some minor calcification) with comfy sun loungers and the gazebo is a great place to relax and escape the heat of the day. The finish and thought which have gone into the villa makes it one of the best on Koh Samui although it would be nice to see a bit more colour and homely warm in the décor. During our stay, the villa manager was charming, knowledgeable and helpful to the extreme, more than making up for the simple English of the other staff. The chef turned out some awesome Thai meals and we understand he can produce a reasonable selection of western dishes too – do mention how hot you like your food though, Thais do like their spices! (Note the management company have a team of chefs so they do rotate a bit, all the chefs we used were excellent.) Don’t bother with shopping and provisioning – let the chef do it, you will pay 30% for the handling cost plus a government tax but it keeps you out of the supermarket which has to be a good thing while on holiday. An excellent villa for a group or family (see surprises), a superb party or wedding pad or perfect for a corporate retreat. The stereo system in the villa excellent as is the coffee from the Siemens coffee machine. Our recommendation – choose some of your favourite music, turn up the volume (there are no neighbours around to complain) and sit on the terrace with your feet up, coffee in hand, taking in the great view. It doesn’t get better than this. In many ways Villa Suralai is well set up for families but parents should note that the infinity pool does have a significant drop-off and also has no section shallower than about a metre. We also noted a number of villas under construction on the way up the hill (due for completion Nov 2012). Architecturally the villa is superb, and while there are a few small design hiccups, regular maintenance ensures everything functions as new. We all had a great and fabulous experience staying in the villa this vacation. Good ocean view, good staff serving team and we all had delicious Thai food serving by the good Thai chef, we are planning next trip now and please let me know if you have any promotion in other better villa. Our stay in suralai villa was very pleasant, the pool is amazing, the view from the villa is very good , the rooms are also very spacious and above all the chef prepared delicious vegetarian food for us. In short it's a perfect place for a group of friends .I would love to go again in that villa. based on 3 user reviews. Villa Suralai is an exquisite villa. The views are superb – each of the bedrooms has full-length glass doors and excellent terraces. The swimming pool is fantastic (despite some minor calcification) with comfy sun loungers and the gazebo is a great place to relax and escape the heat of the day. 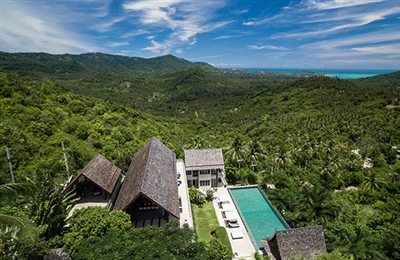 The finish and thought which have gone into the villa makes it one of the best on Koh Samui although it would be nice to see a bit more colour and homely warm in the décor. During our stay, the villa manager was charming, knowledgeable and helpful to the extreme, more than making up for the simple English of the other staff. The chef turned out some awesome Thai meals and we understand he can produce a reasonable selection of western dishes too – do mention how hot you like your food though, Thais do like their spices! (Note the management company have a team of chefs so they do rotate a bit, all the chefs we used were excellent.) Don’t bother with shopping and provisioning – let the chef do it, you will pay 30% for the handling cost plus a government tax but it keeps you out of the supermarket which has to be a good thing while on holiday. An excellent villa for a group or family (see surprises), a superb party or wedding pad or perfect for a corporate retreat.